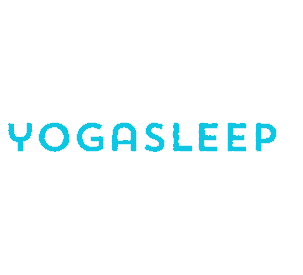 It’s another battle of online mattresses with Leesa vs. Yogabed. Both Leesa & Yogabed are great foam mattresses with a lot of growing popularity and excitement around them, but only one can win this battle. Continue reading below to see which is best! In a bit of a rush? Jump down below to the review summary for the quick version and see which is the right mattress for you. Leesa is a true hybrid mattress. Hybrids utilize differing layers of foams to maximize their positive attributes, while minimizing the negative. The top layer of the Leesa is 2.0 inches of Avena. Avena is a specialty foam that acts like latex, however it has better durability and longevity than latex foam. Like latex, Avena foam sleeps cool by remaining highly breathable and pulling heat away from the top surface of the mattress. The middle layer of the Leesa is 2.0 inches of memory foam. Memory foam is a tried and tested foam found in countless mattresses. It provides great support and relieves pressure points on your body while you sleep. The foundational layer of the Leesa is 6.0 inches of support foam. This is a breathable high-density foam that provides a strong foundation for the top specialty foam layers. The cover of the Leesa is quite different than most others you’d find in a brick-and-mortar mattress store. The cover is virtually 100% seamless. It’s woven from a single piece of fabric (the only seams are those at the corners of the mattress). The single weave, 4-bar design, and thick quality fabric make for a sharp look and a great feel. The cover has a nice thickness to it, but still a pretty good job in terms of breathability and cooling. Personally, I really love the aesthetic. It’s somehow classic, and yet different and modern at the same time. The Leesa is a fairly neutral mattress at a 6 out of 10 on the firmness scale (with 10 being the most firm). Overall, I have found the Leesa to be one of the most well-rounded and balanced mattresses I have ever slept on. It’s currently one of my personal favorites and best mattress on Sleepopolis. 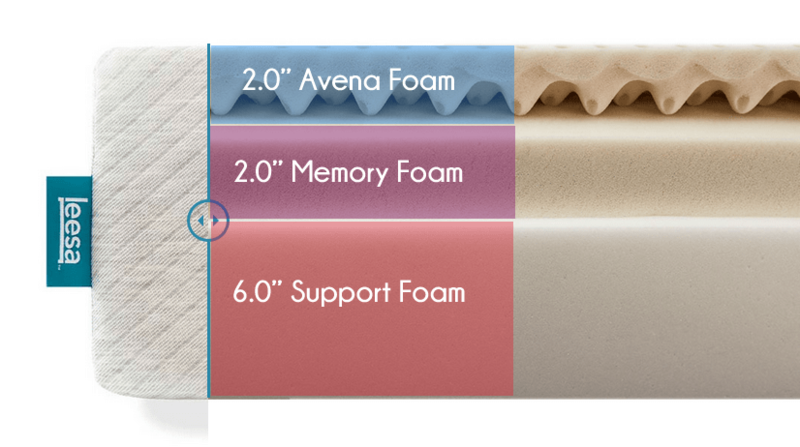 At 4 inches of specialty foam (2.0 of Avena & 2.0 of memory foam) it has more specialty foam than most other online mattresses. More doesn’t always equate a better feel, but in this case I feel like it makes all the difference. In a normal lying position you’ll sink 1-1.5 inches into the mattress (note: I am 145 pounds). This creates a nice comfort balance, without sinking too deep. The Leesa sleeps quite cool. The top layer of Avena helps to pull heat away from the surface. 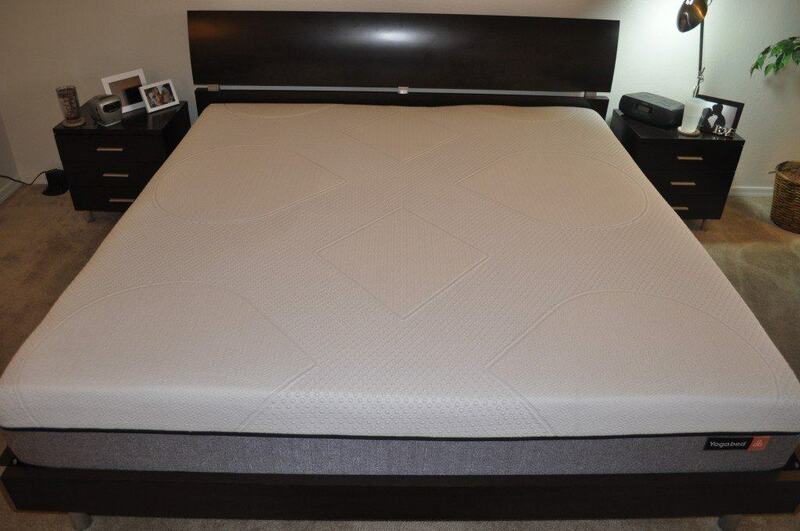 Additionally, having the memory foam sandwiched in the middle means it won’t heat up during the night. 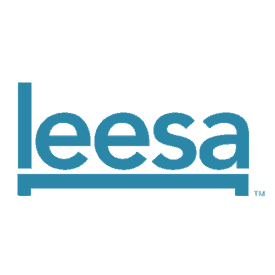 In terms of support the Leesa has a very consistent and stable feeling support in any position. The memory foam helps to eliminate pressure points from arising during the night. Yogabed mattress is also a hybrid mattress. It uses 4 different types of foam to achieve optimal comfort, cooling, and support. 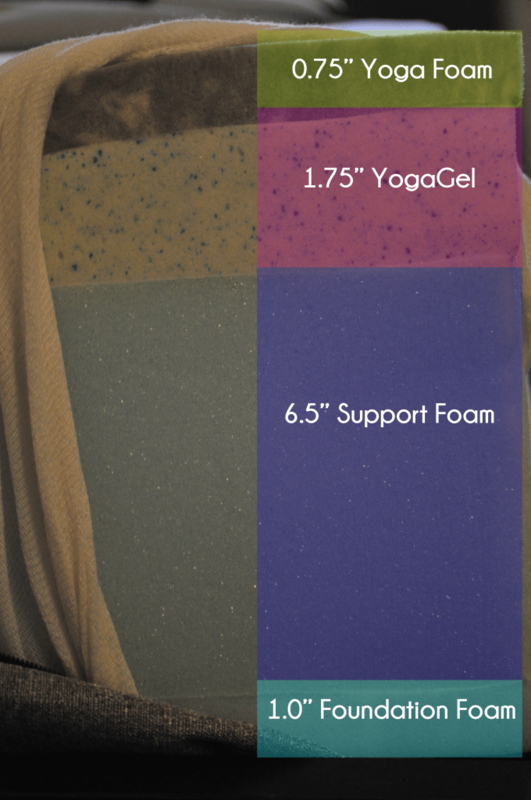 Top layer of Yogabed is 0.75 inches of Yoga Instant Response Foam. This is a custom foam developed by Yogabed. The foam is designed to very quickly mold and change with your body as you move. Additionally, it has a high bounce factor (a little more than a traditional latex foam). Like latex foam, Yoga foam is designed to dissipate heat. The next layer is 1.75 inches of YogaGel. This is another custom foam layer developed by Yogabed. This layer helps to pull heat down into the mattress and disperse it out the side and bottom. Additionally, it provides deep compression support and mattress wide stability. The bottom 2 layers are high-density breathable foams. These layers simply create a strong foundation for the Yogabed, while also staying breathable. The design of the Yogabed is quite nice. It looks similar to Tempur-pedic’s design with the contrasting white and grey fabrics. The top piece of fabric has an interesting textured pattern. What really makes the Yogabed cover cool is how quickly it can be removed. The cover can be removed and put back on in about 30 seconds. Once it’s off you can machine wash it. The Yogabed is a medium firm firmness at a 6.5-7 out of 10 on the firmness scale (where 10 is the most firm). The most unique attribute of the Yogabed is the feel. It has a high degree of bounce. Based on the feedback I have received from my readers people either love or hate the bounce factor. The Yogabed has a moderate degree of sinkage and hug. In a normal lying position I was sinking 1-1.5 inches into the foam. The denser top layer of foam on the Yogabed results in more of a push-back type of feeling. While there is a degree of contouring hug, the push-back and bounce counteract this a bit. In terms of cooling the Yogabed does a pretty good job. The gel middle layer helps to prevent build up of heat. Support was equivalent to the Leesa. Consistent support in any sleeping position. Should you buy the Leesa or the Yogabed mattress? Both the Leesa & Yogabed are great mattresses, but all things considered I think the Leesa is the better mattress. The Leesa has a very balanced feel that is difficult to beat. It has great support without lacking anything in terms of comfort or cooling. There is a balanced sinkage that enhances the comfort combination of the Avena & memory foam. Furthermore, the Leesa has 4 inches of high-quality specialty foam (this compared to only 2.25 inches in the Yogabed). More foam doesn’t always translate into better feeling, but in this case I think it is a major factor in the comfort and support that the Leesa provides. Also, more specialty foam means that the Leesa is comfortable for both thinner and larger sleepers. No matter how much pressure your body puts on the mattress, Leesa does a great job of supporting. All factors considered, I believe the Leesa is the better mattress. You want a mattress with neutral firmness – at a 6 out of 10 on the firmness scale (where 10 is the most firm), the Leesa is perfectly positioned in terms of firmness. The vast majority of sleepers will be able to enjoy this firmness level. It provides good support, but is still soft enough to be comfortable. You want a balanced sinkage and hug – Leesa has a very balanced level of sinkage, hug, and body contour. It contours to your body and hugs you without pulling you in so deep that it becomes hot or prevents you from easily changing positions during the night. You want a responsive mattress – Avena foam reacts similarly to latex foam by rapidly adjusting to changes in your movements. This allows you to never feel “stuck” in the mattress. 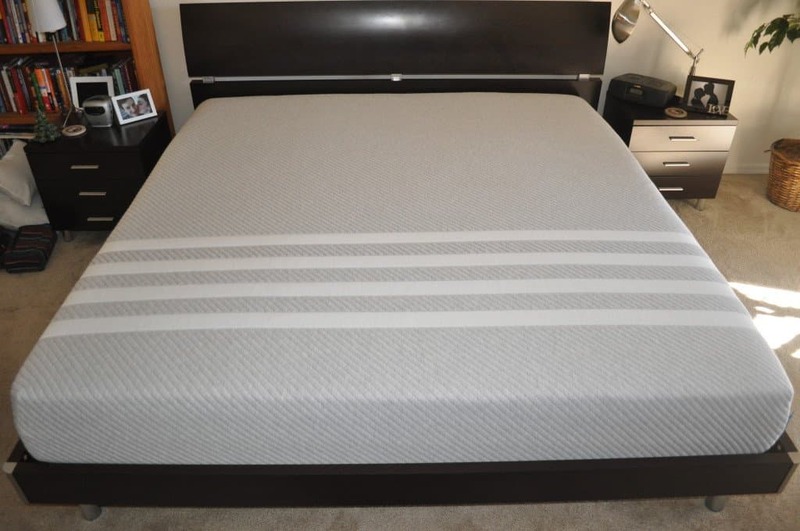 You want great value in a mattress – I’ve slept on and reviewed nearly 20 online mattresses, out of everything I’ve tested the Leesa remains one of the top overall mattress values. The use quality and thick foams, well put together cover and design, built and sourced in the USA, and have great customer service. You want to support a company that helps people in need – Leesa gives 1 mattress away for every 10 they sell. In my book, this is just really cool. Leesa has had this policy since the first day they launched. It isn’t some marketing gimmick, it’s just who they are as people and a company. Just really refreshing to see this in a company. 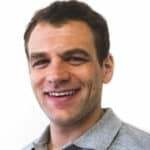 You want a slightly firmer mattress – at 6.5-7 out of 10 the Yogabed is slightly firmer. If you need a slightly firmer, but not too firm feel, to feel comfortable and supported the Yogabed can be a good fit. You want more bounce – the Yogabed has slightly more bounce the Leesa, which gives it a little bit of a different feel for sleep, sitting, and amorous activities.